Do you let your kids talk to strangers? When you see a homeless person do you avoid eye contact and tug at your kids’ sleeves to keep walking? Does the big city scare you? My friend Gabi is a World Changer. She has practical ideas, strong opinions and a big heart. Helping other people is a simple, common sense idea to her, and she’s desperate for The Church to cut the crap and get to work. She and I are Stubborn Soul Sisters in this regard. I really do want my kids to be World Changers, but sometimes I chicken out. Our family’s Compassion Focus last year was Homelessness. 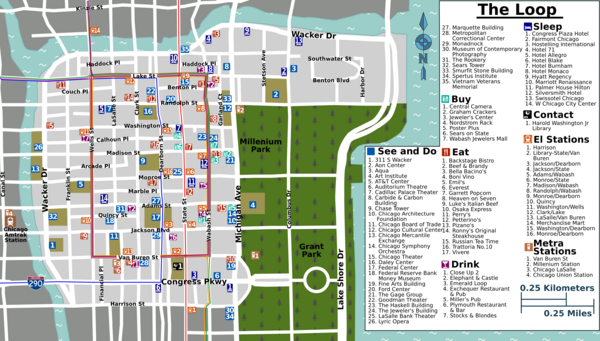 We focused on our county, town, and school, but we never made it to downtown Chicago. We learned many new things, but we did not learn how to befriend a homeless person on the street. Gabi’s kids have been serving the homeless for a long time. Their daughter Mary started going downtown to love homeless people when she was 5 years old. Look and see what she’s up to now. Gabi, please tell us about your Mary. Mary is 7 years old. She has two older brothers, Charlie and Sam, a cat, and a bearded dragon. She loves people, is brave (had two open heart surgeries as a baby), and has a tender heart for suffering. She’s naturally outgoing and has a smile always at the ready. How did your family start loving and serving the Homeless? Our family has long had a heart for the homeless. When our oldest two were little (Mary is the youngest) we helped with PADS (a ministry that coordinates local churches providing nightly shelter to the homeless). We would bring food, and when dropping that off, we would help set up the sleeping mats and blankets. 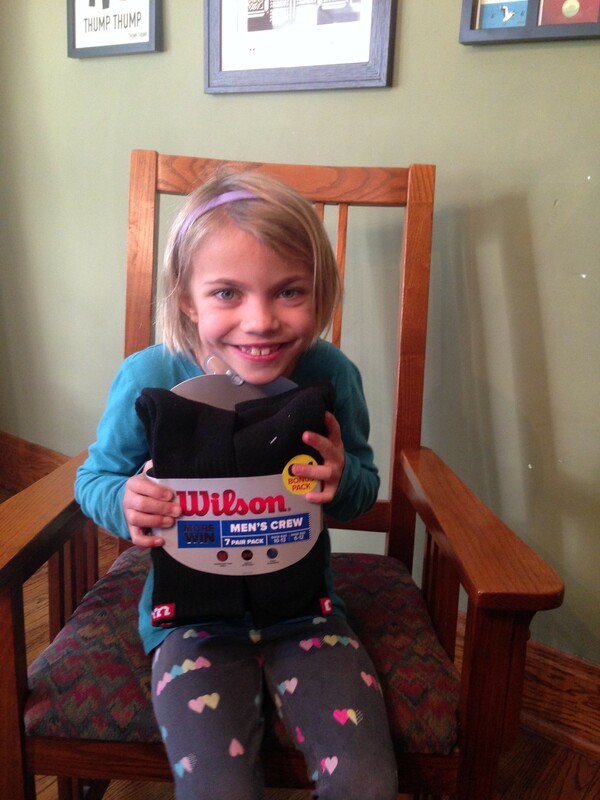 We love PADS because it is something you can do with any aged child. Young children (and parents wearing babies) can help assemble lunches, decorate the brown paper bags, set up the sleeping mats and help serve food. 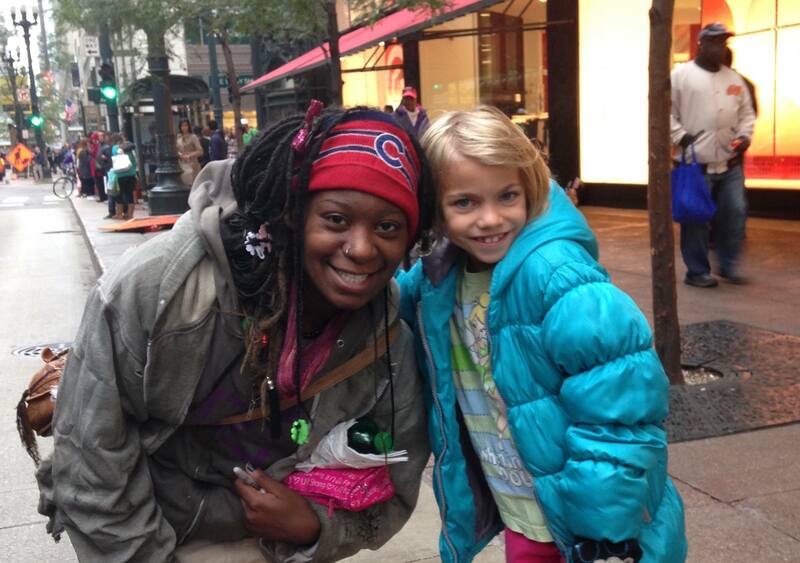 A couple of years ago, a friend from church invited our oldest to go with her downtown to feed, and pray with, Chicago’s homeless. This is a a grassroots effort. They just walk around the Loop seeking need. Mary begged to go, and finally on Christmas Eve 2013 she was able! She loved it and goes as often as possible ever since. She sees a lot of “regulars” so knows some of them more personally. Mary and her friend, Sparkles. They met that first night on Christmas Eve. Now they are pen pals, and our friend from church, Gayle, is their “post office.” Mary prays for Sparkles every night. How did Mary decide to to collect 800 pairs of socks?! Why does Mary want to do this? Mary knows how cold her feet get when she is walking around the city – and she has warm socks and waterproof boots. She also has a safe car with heat blasting and a house to come home to with a cozy bed to snuggle in. She has seen them in the winter and knows they are freezing. 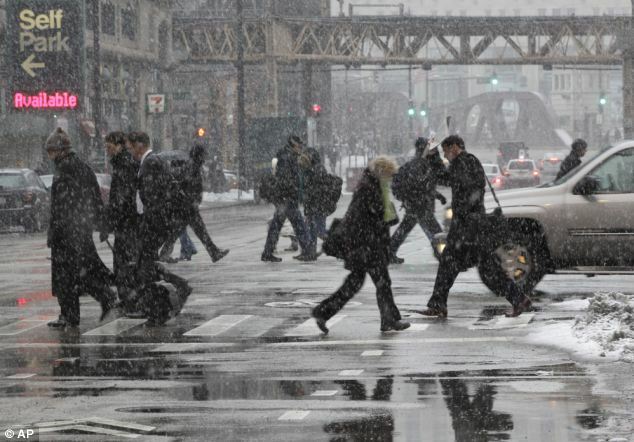 Socks are a big deal because if your feet are wet and cold, the rest of your body is, too. What’s been the hardest part about doing a Compassion Focus like this? We want to be sure to thank everyone who has donated. Also, recognizing that we can’t save every person. There will always be people who didn’t get socks, or a lunch, or a hug. We can’t save the world. But we can help feed, and clothe, and love, a few at a time. Think about what breaks your heart and figure out a way to help. Look around. Who looks lonely, or scared, or sad? Ask your kids. Kids are very intuitive and and easily recognize suffering. Start small. Pick something that seems relatively easy to do and try it. 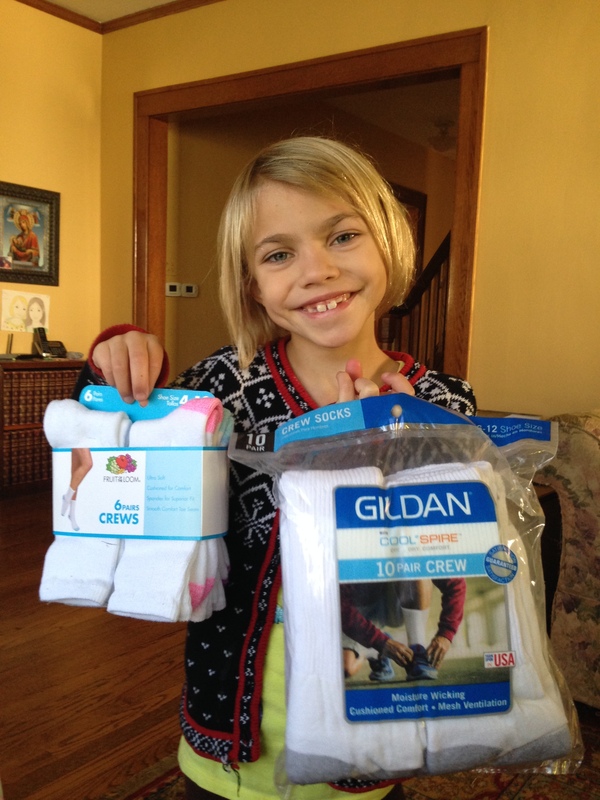 Compassion doesn’t have to be something big like gathering hundreds of pairs of socks or raising lots of money. It doesn’t have to be part of an organized program or church. Compassion can be checking in on your elderly neighbor or playing peek a boo with the cranky baby in front of you in line. How can we join you in Mary’s project? 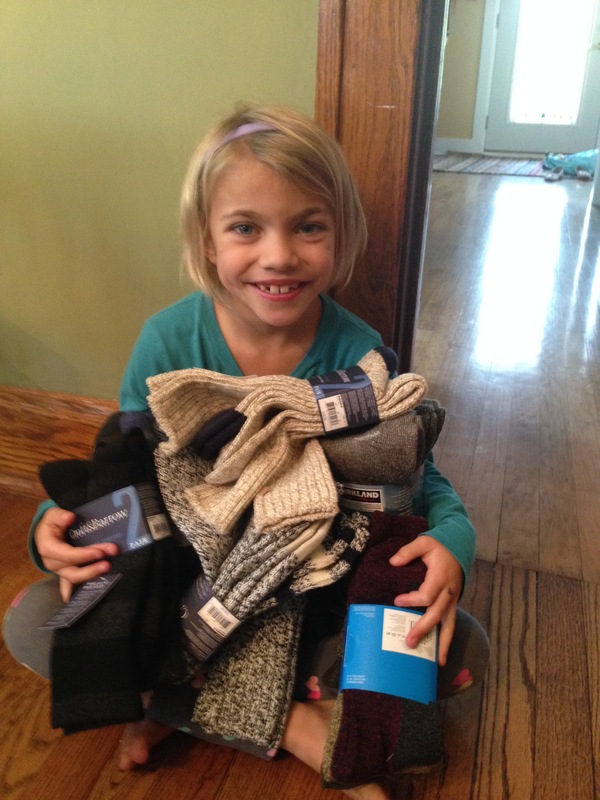 We would love your help in gathering socks for Mary to hand out! She and her friends will be tying a handwritten note around each pair. We are collecting socks through the end of October. If you can’t send socks, please just look around your own neighborhood. When you see a homeless person, stop and say Hi. The homeless feel invisible and worthless. See them! 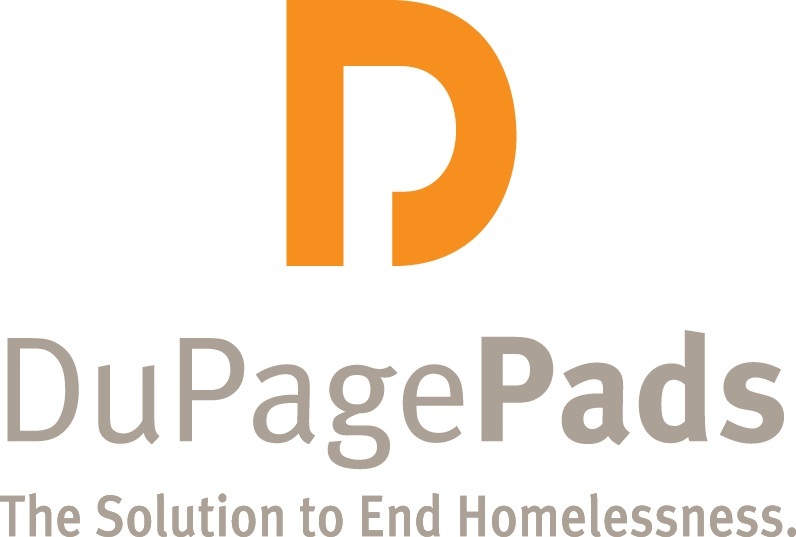 If you are going somewhere where there will be homeless (almost anywhere!) bring a box of granola bars, hand them out when asked. Even if you have nothing material to give, look them in the eye and smile. Please do not ignore them. We know it can feel uncomfortable at first. I promise they don’t bite. Some people are hesitant to give directly to the homeless, worried about inappropriate choices the person may make. Good news! We aren’t judged by what they do with what we give them. We are judged by what WE do. Thank you for your help! Mary’s family gave her a strong, compassionate foundation by serving the homeless together when she was tiny. 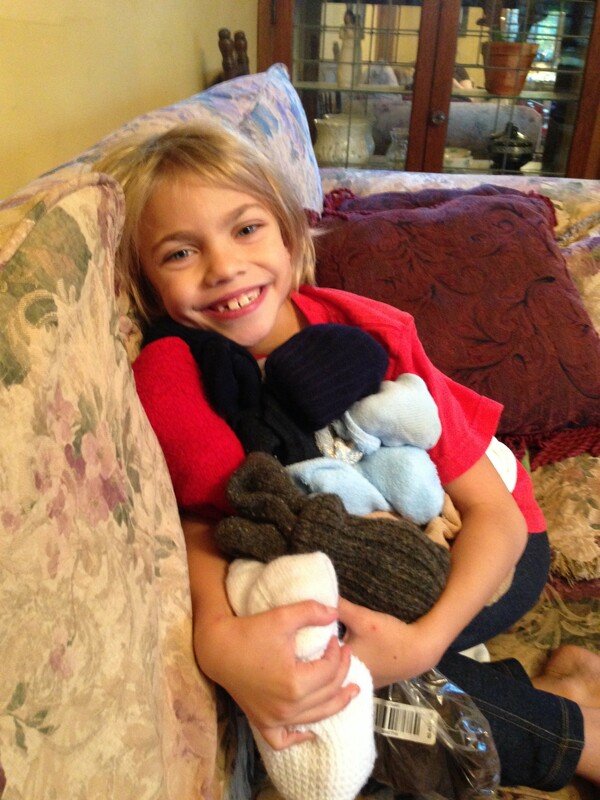 Now the desire to give hugs, friendship, and practical help to the homeless is her own idea. Mary is only 7 years old and she’s Changing the World. Thank you, God. To learn from other World Changers, you can read about the Seversons, Bergers, Farrells, Evans, Powells, and Greta. To learn how the Family Compassion Focus got started, read Our Story.